For some weeks now, I’ve been obsessed with the film Julie and Julia. For those unfamiliar with the film, it’s about blogger Julie Powell’s attempt to cook all 524 recipies of Julia Child’s “Mastering the Art of French Cooking” in 365 days. A wonderful romantic comedy exploring the struggles of the titular characters, this movie was also the best “foodie film” i’ve seen in a while. 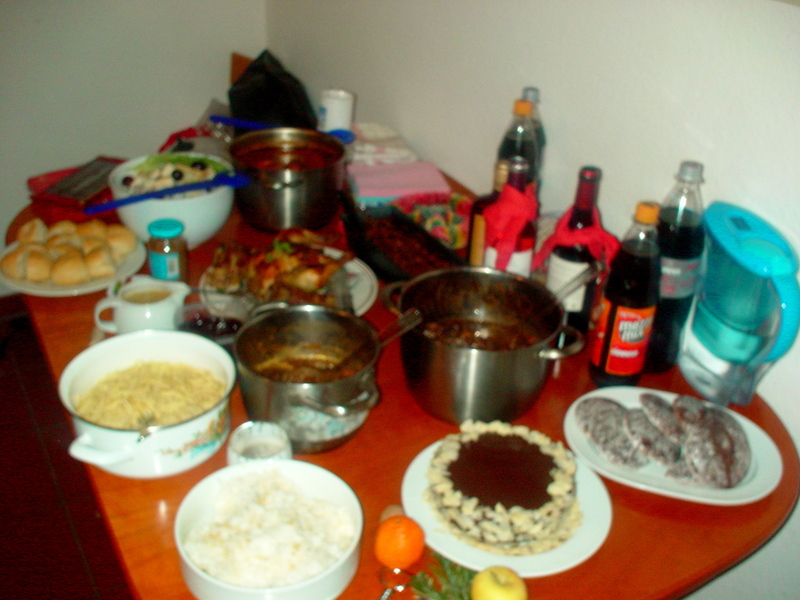 When I knew my friends Oui and Chinggay were coming to Heidelberg for Christmas, I made sure to plan a party with memorable food. Of course, being far from home, I immediately thought that some Filipino food would help with the holiday homesickness (thus the Christmas dinner Oui posted about). For our Christmas day lunch, however, I wanted something a bit more extravagant since my other friends from Heidelberg would also come over. Still not over my “Julie and Julia” phase, I took my inspiration from it and prepared dishes featured prominently in the film along with some other ones that had a Christmas feel. So here’s our Christmas lunch menu! Recipies will be featured in succeeding posts. Since we did last-minute shopping for this dish, the supermarkets all ran out of walnuts! 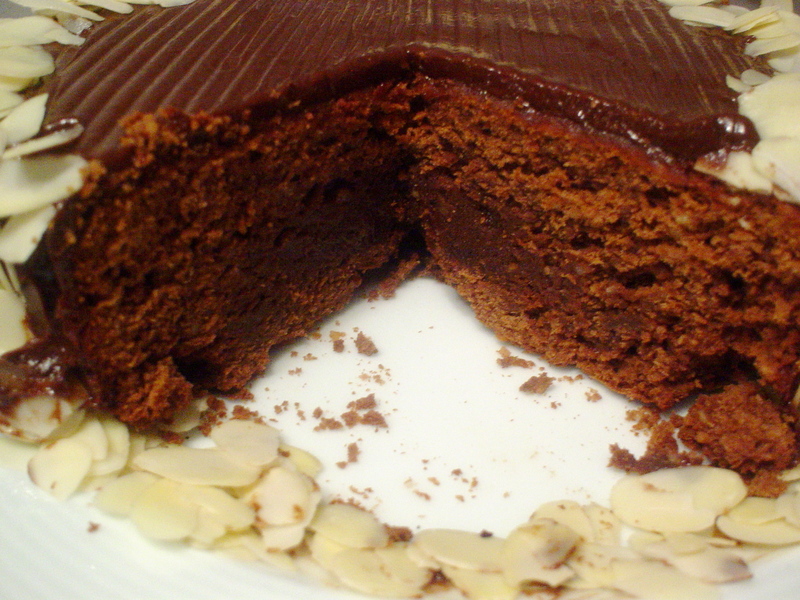 I decided to substitute hazelnuts and it still turned out fine. I used three kinds of apples for this one: Red Gala, Pink Lady, Granny Smith. I originally wanted to roast a whole duck or goose, but since I wouldn’t have room in my fridge to thaw the thing two days before Christmas, I opted for a smaller chicken and two giant turkey legs. The poultry was massaged with herbed butter (with thyme, oregano, garlic, and nutmeg) and baked. Towards the latter part of the baking, it was basted with thick cream about three times. 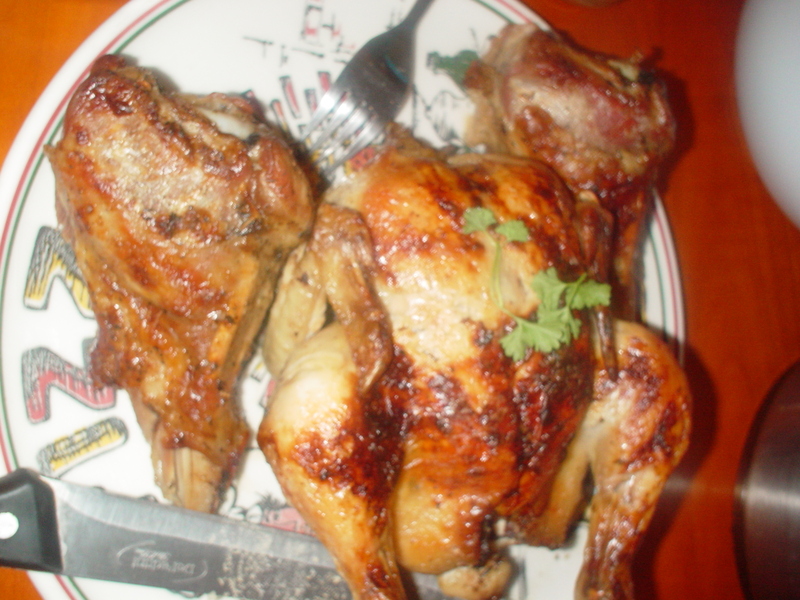 The cream-basting was inspired by a recipe from “Mastering the Art of French Cooking”. The creamy drippings was then used to make the gravy. 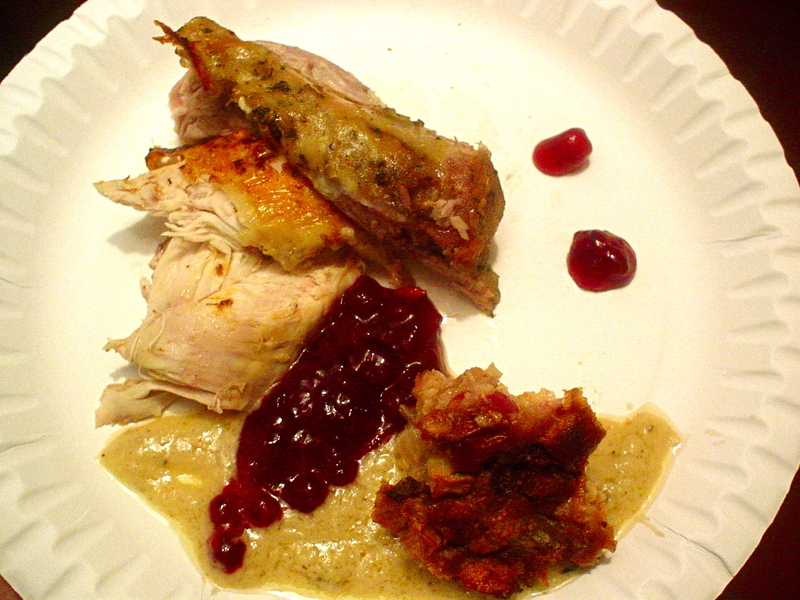 I bought sour cherries in syrup from the supermarket and I wanted to use them in a stuffing for the roast poultry. 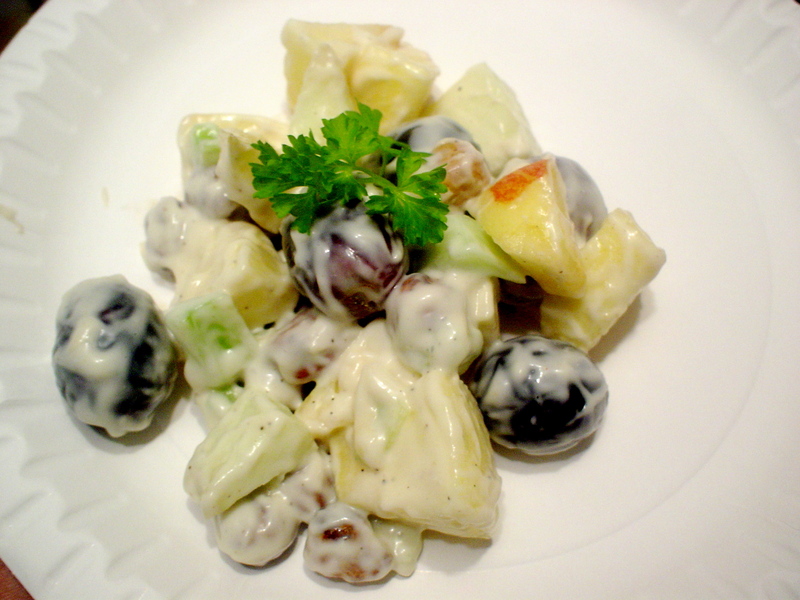 I then searched for a recipe online and that led me to something that used pears, croutons, and sour cherries. I wanted a savory component to the dish, so I just made up my own recipe on the fly, adding onions and fresh bratwurst. I was crossing my fingers the whole time I was cooking it and was just basing everything on my knowledge of the individual ingredients’ flavors. In the end, it turned out a success and was the dish that got the best reviews! In a cold country, nothing says Christmas more than a warm, hearty stew. For this, Oui volunteered her Afritada. 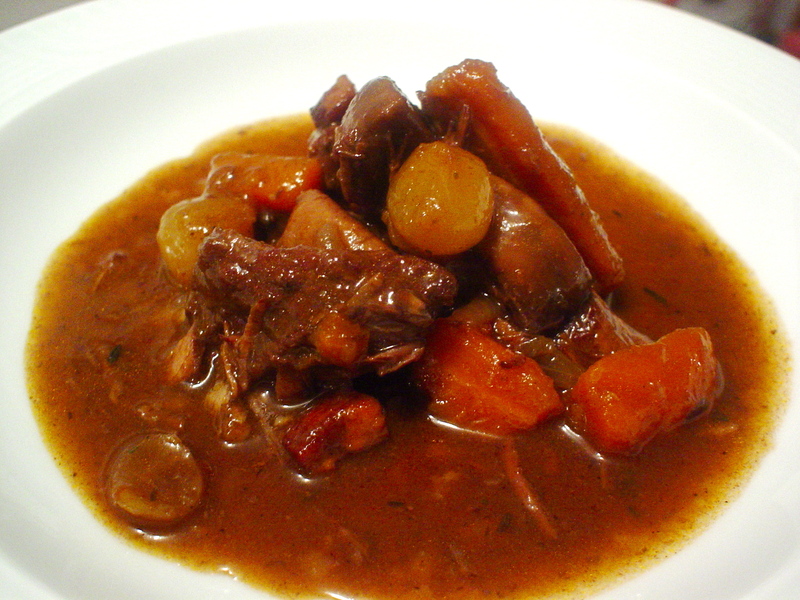 On top of this, I knew there was only one other stew fit for the occasion, and that was Boeuf Bourgignon. 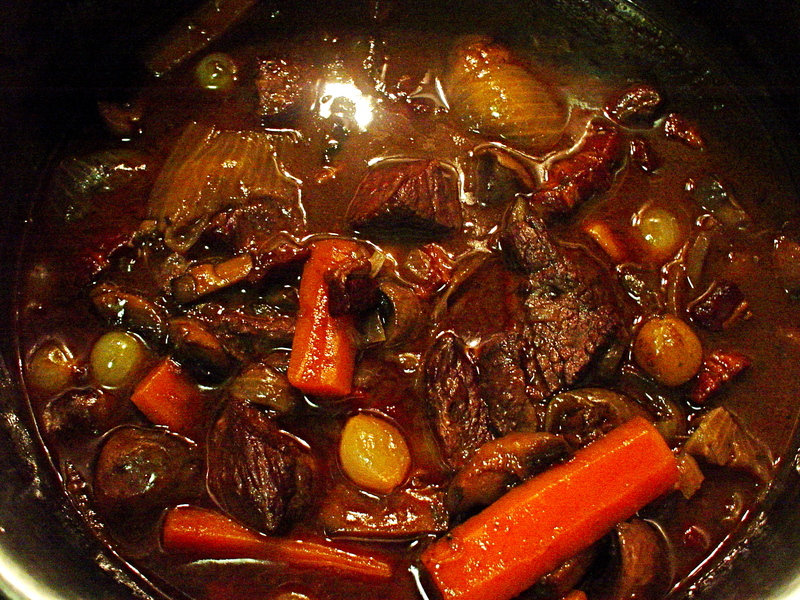 Julia Child’s Boeuf Bourgignon. We followed every step as much as possible, except that we couldn’t find any good Pinot Noir from the Bourgogne region, so we just followed Julia’s suggestion and used a nice Chianti. Also, I added about two tablespoons of sugar to balance the acidity of the wine. Since I had vegitarians in the crowd, I also made one sans beef but with extra mushrooms. The preparation for the bourgignon was intense, but in the end it was all worth it. When we opened the lid after simmering then slow-cooking in the oven for two and a half hours, the scent was intoxicating. 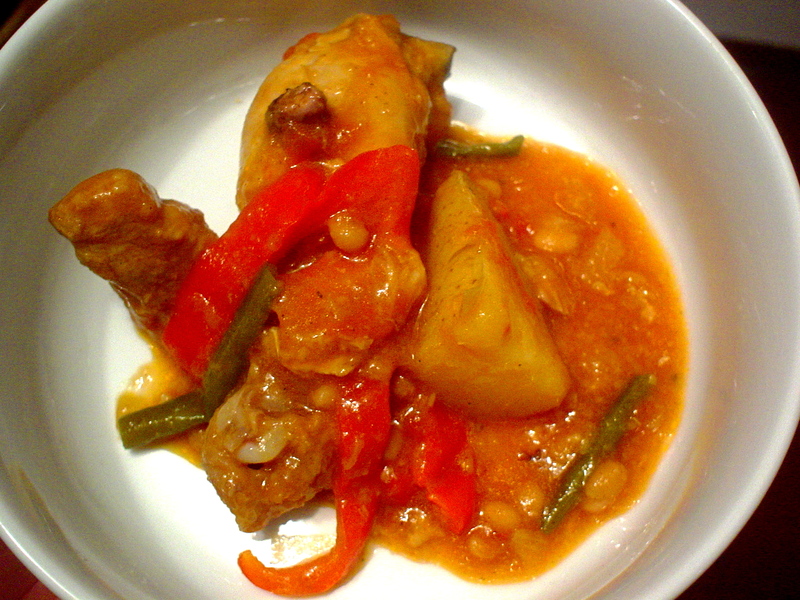 Even before seasoning the stews, we were already impressed with the depth of flavor in there. It was umami like we had never tasted before. The first bite into the melt-in-your-mouth beef was pure bliss. (I’m salivating now just thinking about it again. I think I’ll thaw out some leftovers now…) I’m so glad I tried out this recipe and added it to my repertoire. Note: We cooked this the day before and just reheated it in the oven in time for the party. It tasted even better! 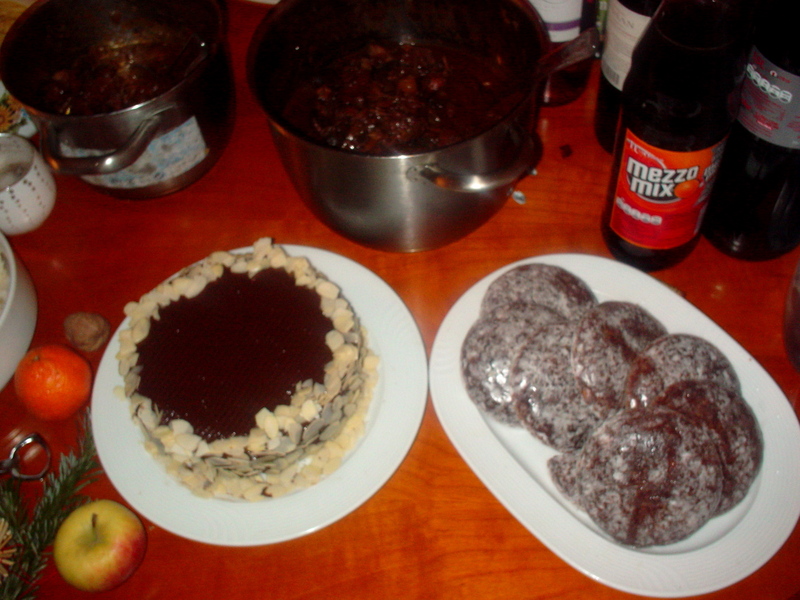 This cake was also featured in “Julie and Julia” in a montage of cooking sessions. The characters looked like they enjoyed the cake so much that it inspired me to try it out. 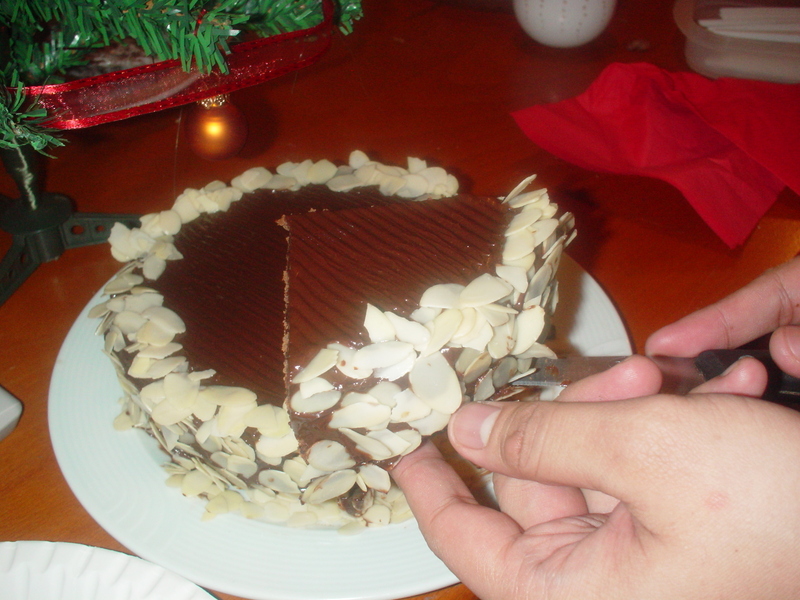 The cake was very easy to make (thanks to my Christmas gift to myself: a Tefal Prepline Stabmix/whip set). I deviated from the recipe and added a tablespoon of Amaretto to the choco-butter icing. We also enjoyed shots of the liqueur while eating the cake. It was like biting into a rich giant fudge brownie. Yum! Also, a German Christmas wouldn’t be complete without some Lebkuchen, so I got a roll of the genuine glazed Nürnberger Elisen Lebkuchen (ie. the expensive one) which we all enjoyed. Frohe Weihnachten und einen guten Rutsch ins neue Jahr! Maligayang Pasko at Manigong Bagong Taon! Dappie, You HAVE to make all of this when you get back to Manila! I just re-read your entry at 2 AM. And geez am I hungry! There are disadvantages to living in Casa Mama in that I don’t really have control in the kitchen. 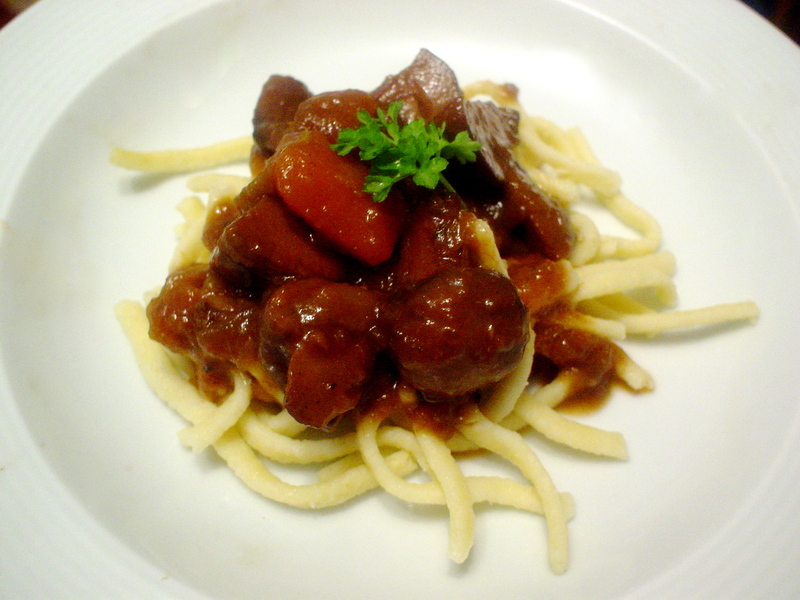 Must try out Boeuf Bourgignon with Janet when I come back to Germany.